A view of Otter Cove taken while I was exploring along the rocks of Otter Point. 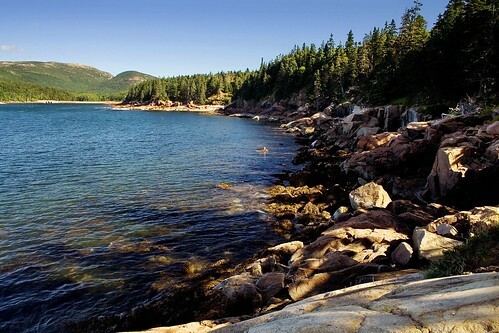 Cadillac Mountain is visible in the background, towering above the cove. This entry was posted on January 9, 2009 at 7:46 am and filed under Acadia, Acadia National Park, Bar Harbor, Cadillac Mountain, cove, Maine, Mount Desert Island, mountain, National Park, Otter Cove, Otter Point, vacation, water.